Jon Jon Smuts was born in Grahamstown on the 21st of September 1988 where he later went to high school at Graeme College. As a youngster his love for cricket started off when he used to watch his dad playing and then he would play with his brother for competition. As a batting all-rounder and the Warriors Cricket captain he has been pivotal for the team since he joined the team in 2007 and he prides himself on bringing seriousness and his leadership skills into the team. 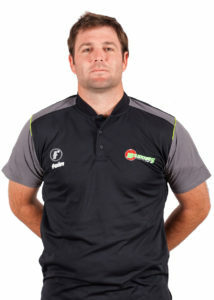 Jon Jon has played for the Eastern Province team in the 2015 Africa T20 Cup, in 2010 he was selected for the South African Emerging Players squad and was the 2010/2011 player of the season for the Warriors. Jon Jon has played for South Africa A and the South Africa Under-19s side. In 2016 he played in the Caribbean Premier League for St Kitts and Nevis Patriots In 2017 he made his South African T20 International debut against Sri Lanka, where he dubs his debut for South Africa as his most memorable cricket moment. Jon Jon loves spending time with his family or playing golf on his off days, if he was not a cricketer he would be a pro golfer. He loves the playing styles of Jacques Kallis, Ricky Ponting and Brian Lara.